This amazing expansion for the Starfinder Roleplaying Game allows your heroes to stake their claim as princes of the universe and suzerains of the stars! 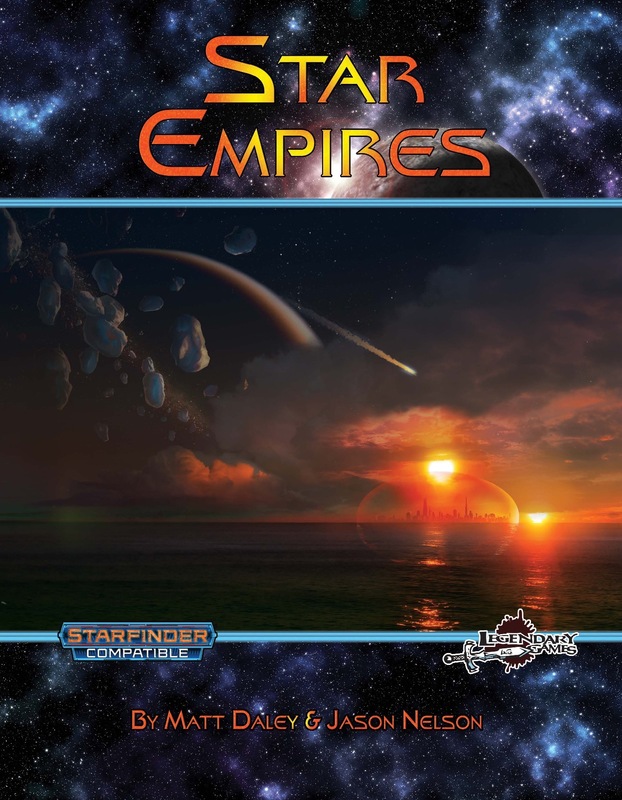 Star Empires brings you extensive rules for founding colonies of your own and expanding them to form an empire, with a flexible and modular system that applies to territorial expansion on a single planet to interstellar empires that span multiple systems. Build colonies from simple modules to sprawling metropolises, fine-tuning the balance of law and corruption, industry and culture, prosperity and popularity! Develop your own governmental ethos, exploring and expanding your domain and issuing edicts to manage your empire's economy and stability while keeping your citizens loyal and productive. You can play with a simple, abstract system or use any number of optional rules to develop trade, diplomacy, and more, and Star Empires also includes a modular system for mass combat in a sci-fi setting, allowing you to build armies to defend your colonies from invading enemies or raise a mighty crusade to crush the resistance of any system in your path. Your heroes have explored new worlds, uncovered interplanetary conspiracies, and boldly gone where no one has gone before, but in between your adventures and endless weeks cruising the spaceways now they can return home to their shining capital to build their own sci-fi society, from conquering techno-legions to peaceful utopia! Grab this incredible 100-page Starfinder supplement today and Make Your Game Legendary! Note: Download also includes PDF Army, Colony, and Empire sheets to print and use with your Star Empire! 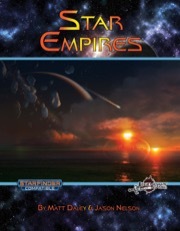 Btw, Star Empires is also available in print and print/PDF bundles at the Legendary Games webstore! Still the #1 Starfinder product at DrivethruRPG - see if we can get it to #1 here at Paizo too! Star Intrigue is coming today!!! Check it out as soon as it gets posted here at Paizo… or head over and check it out RIGHT NOW at the Legendary Games website! Hi Jason. Is it possible to sell printed (or POD) copies through Paizo? 1. Print sales on Paizo only pay us 50% of the book's price (PDFs get us 75%). 2. Print sales on Paizo are entirely done on consignment, which means we have to preemptively guess how many will sell and send those to Paizo, but we don't actually get paid until or unless they sell. As a result, we have to pay to print and ship books to Paizo, where they remain in the warehouse until selling, which means that of every 10 books we send, we have to sell around 7 or 8 of them before we see *ANY* profit from those print sales. Unless it's a product that sells on a regular and predictable basis, or unless it's a big print run of hardbacks where our per-unit print cost is relatively low, it's literally better for us to not sell most books in print here than to take the chance of dead inventory sitting there gathering dust because we guessed wrong and over-ordered. That said, we'd LOVE to have you purchase print books through the Legendary Games webstore! It's possible, though we have one or two still in production and we'll see how that goes. We might also combine them with the backmatter in the Legendary Planet Campaign Setting. We shall see how it all shakes out in the end. Thanks, Jason. I did end up getting this (and star intrigue) from your site. To be frank, I find it difficult to find stuff there, no doubt compounded by the fact I only want print stuff. I appreciate it doesn’t currently make sense for you to sell them here though - thanks for the detailed explanation. Way more than I was entitled to hear, but I always find that stuff interesting. I’ll keep my fingers crossed for the Legendary Worlds coming out in print. I love the idea but just can’t get into PDF-only products. Speaking of Legendary Worlds, we've got another one in layout now, Russ Brown's Polaris 7, coming for Pathfinder, Starfinder, and 5E! In the course of building your interstellar empire, sooner or later someone is going to tell you to bugger off, and that's when it's time for the new STAR BATTLES expansion! Check it out starting today right here at Paizo, or grab the print version or print/PDF bundle at the Legendary Games webstore!